Big post here, but I want to mention up front that this is a free patched version that we are sending out today to everyone that received the original V0.04 release. Please note that your saves from V0.042 should be compatible with this new version. This updated release is intended to fix the issues that were present in V0.04 and serve as a solid foundation to begin work on V0.05. Note that while we do intend to relocate the fuse puzzle to a different portion of the game where it can be better utilized, that won't occur until V0.05. You will however see some improvements to it that will be present in its later form. A previously unmentioned and somewhat significant addition however is an improvement to how "Wait" battle modes operate. We've added a prototype system for a button (SHIFT on the keyboard) to pass time while using one of the three "wait" battle modes. Simply hold the button/key during a character's turn and time will flow like normal. This is to remedy the strategic issue with wait modes where timing can make it impossible to time an interrupt an enemy's attack, or even worse cause stun-locks with grapples due to an inability to break out of a grapple at an advantageous time. Please see below for the full change log! Fixed issue where some graphics would not appear if the RPG Maker VX Ace RTP was installed to a custom location. Added a prototype "Pass Time" button/key (SHIFT on the keyboard) for the three "Wait" battle modes. Simply hold the button/key during a character's turn and time will flow like normal. This should remedy the strategic disadvantage caused by an inability to properly time interrupts and grapple breaks when using a "Wait" mode. Improved Escape functionality for "Wait" battle modes. Time will now pass while the Escape button/key is held, meaning the player no longer has to select an action just to continue escaping. Lowered evasion of Vorepups and Ven. 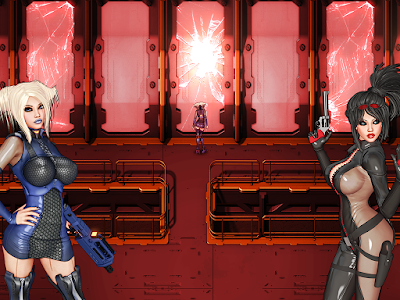 Malise's Dual Fire now correctly calculates hit results for each shot independently of each other. Increased attack power of Malise's weapons. Added something to each of the puzzle rooms that should make the area more navigable. Made some dialog edits to fix some ambiguity with the story, as well as to clarify that the number beside fuse puzzle gates is the *minimum* current required and not the exact current required to unlock these gates. Changed the fuse puzzle rewards that are left behind by a certain robot. Lowered the cost of FuseBot's hints to one 5 Amp Fuse. Added a more accessible Circuit Board to the puzzle area. Increased the number of FuseBot's hints from 3 to 7 and improved their order/wording. Also added small cutscenes to better show what is being referred to. Added warning text when a trapped chest has been opened. Errors involving sound files will no longer crash the game. Added a dialog prompt with info when GFX/audio files are encountered that are missing. The prompt will only appear once per session. Fixed experience bars showing incorrect values on the Save/Load screen. Fixed Darkness state behavior on character death. Fixed issue that would sometimes cause increased loading times. After I finished my part on the patched version I went into cleaning mode, leaving AltairPL to handle the fun fixes. For the past week or so I've been making a real effort to reorganize and clean out all the data related to the game. This data includes 3D asset libraries, 3D scenes/project files, render libraries, Photoshop files, 2D graphics assets, music and sound effects, scripting resources and so on. Even though it's a relatively simple 2D game, there are a lot of pretty advanced processes going into making the artwork and graphics, yielding nearly 200 GB of data (not including backups). As the game's requirements are realized, the workflow and organizational structure of all the working data changes, and now is a good time to simplify and sort everything since TK is starting full time this week. At the pinnacle of all this is the fact that we're going to attempt to move to a cloud-based environment so that TK and I don't have to send multi-gig assets back and forth all day. We're going to start testing possibilities later today, so hopefully that pans out. Unfortunately, organizing and patching doesn't produce much content, so there isn't really much new to show off. We are however beginning to plan for V0.05. AltairPL's main goal for this cycle will be the the map overhaul. It will potentially be the biggest task yet in terms of overhauling RPG Maker, but is important because it will significantly improve performance, allow for more events and complex map graphics, and possibly the most important is that it will dramatically simplify making maps with all of the features we've been adding over time that simply aren't available in RPG Maker. Doing this now is important since it will no doubt require some reworking of current assets and significant map edits that I'll have to be involved with. Basically, the sooner we knock it out the better. As far as content for the next release goes, I have to sit down with TK and figure out what we want to tackle. Bringing him up to speed is my main task, so having him working on things that I know he can learn quickly is important this time around. There will definitely be at least one new story H scene that I've had planned, as well as the relocation of the fuse puzzle. As far as the rest goes there are a few different possibilities that I'll sit on until I know which direction we're going. I'll be sure to post an update though once things are more concrete! As always, thank you for your continued support and feedback! Just a small mistake I noticed. Have you noticed that Malice is holding two revolvers on every CG of her but when she attacks her left revolver vanish? Even on the double shot, that second revolver don't appear.